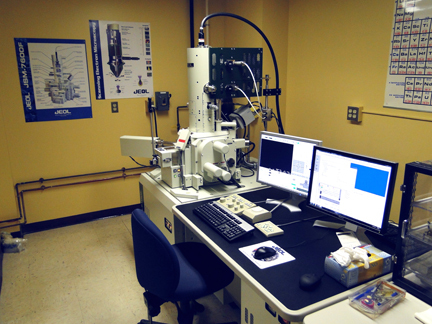 The laboratory centers around a newly acquired JEOL JSM-7100FLV field emission, variable vacuum, analytical scanning electron microscope (FE-SEM/EDS) (2012). JSM-7100FLV SEM/Noran System 7 EDS installed in December 2012. This instrument is equipped with a sample chamber-level secondary electron detector and both HV and LV backscatter detectors. It is equipped with a Schottkey thermal field emission gun and offers resolution of approximately 2-3 nm at 30 kV. The SEM is equipped with a Thermo/ Noran System 7 Energy Dispersive Spectrometer with a LN-free digital detector. This system enables quantitative spectrum analysis with and without standards, spectral imaging, x-ray mapping, x-ray line scans, point and shoot sampling, and digital image acquisition. 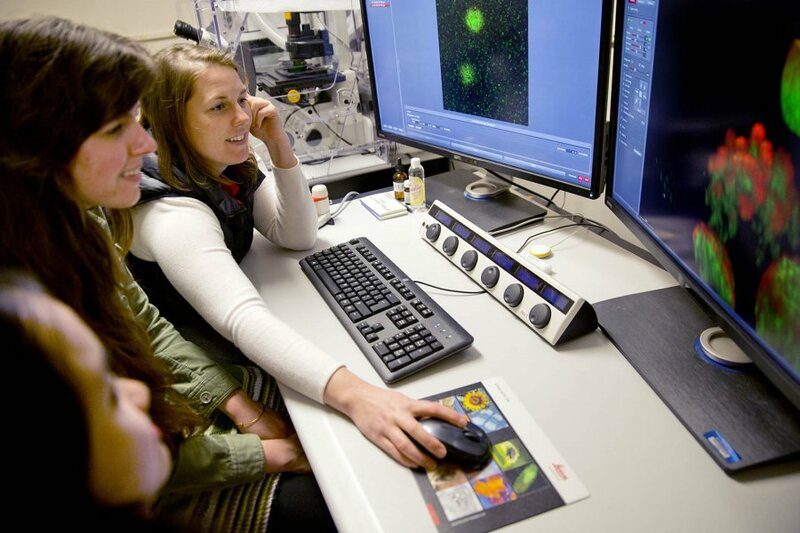 The Leica confocal microscope came on line in Fall 2014 and is used extensively by biology, physics, and neursoscience faculty and students.